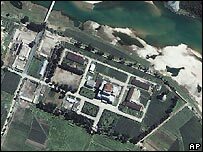 North Korea has shut down its nuclear reactor at Yongbyon, a US state department spokesman has said. Sean McCormack said that the US had been informed of the shut-down by North Korea and was now awaiting verification from the UN nuclear watchdog, the IAEA. A team from the International Atomic Energy Agency is in Yongbyon overseeing the closure, taking place under a deal agreed in February, but much delayed. Under this deal Pyongyang got its first heavy fuel oil shipments on Saturday. "We welcome this development and look forward to the verification and monitoring of this shut-down by the International Atomic Energy Agency team," Mr McCormack said in a statement as the news was announced. If confirmed, the shut-down would be the first stage in disabling the North's nuclear programme. The IAEA's 10-member team are to decommission and seal equipment at the reactor and plutonium reprocessing plant. It may take the inspection team up to three weeks to complete the task, says the BBC's Kevin Kim in Seoul. In nuclear talks held in Beijing in February, North Korea was promised heavy fuel oil in exchange for the Yongbyon shut-down. The deal was delayed amid a wrangle over North Korean funds frozen in a Macau bank account. But the first ship of oil arrived in the North Korean port of Sonbong on Saturday, loaded with 6,200 tonnes of heavy fuel oil. On Friday, the chief US nuclear envoy, Christopher Hill, emphasised that the closing of the Yongbyon reactor was only the first step though. Mr Hill said he expected a full list of the North's nuclear facilities within months - as agreed in the February deal. North Korea tested an atomic bomb for the first time last year, and has repeatedly said it needs nuclear weapons to fend off a US attack. Talks involving South and North Korea, Russia, Japan, the United States and China are set to resume in Beijing on Wednesday to map out the next stage of the process.